On December 16, 2014, President Obama signaled his intent to sign newly passed legislation that will expand sanctions against Russia and provide $350 million in arms and military equipment to Ukraine, as it continues to battle terrorist elements armed and empowered by Russia in eastern regions of Ukraine. “The president does intend to sign the piece of legislation that was passed by Congress,” said Josh Earnest, the White House press secretary.” Analysts opined that President Obama had little choice but to sign the legislation, in light of Putin’s outright aggression. Russia has continued to violate the terms of a Minsk agreement by providing military and material support to the terrorists/separatists in Ukraine. Obama is expected to sign the new legislation by the end of this week. Unperturbed by Netrebko’s activities, the Metropolitan Opera representatives stated: “As an artistic institution that believes in freedom of expression, the Met does not have to be in agreement with the personal views of the artists who perform on its stage. We support Ms. Netrebko as one of the world’s leading opera singers and we are proud that she sings at the Met.” In October 2014, the Metropolitan Opera faced accusations of supporting terrorism with respect to the performance of John Adams’s “The Death of Klinghoffer.” Political figures, including former New York City Mayor Rudolph W. Giuliani, joined a rally to denounce an opera that was seen by many as anti-Semitic and pro-terrorist. 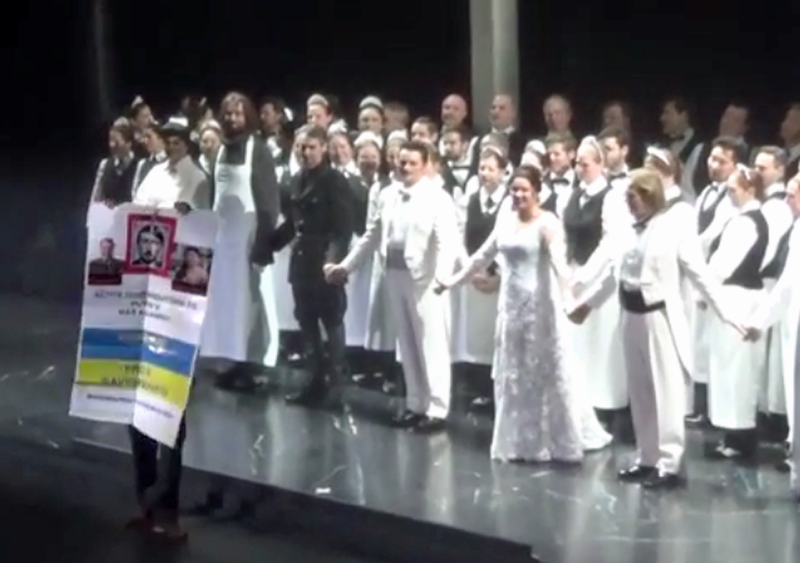 In spite of the protests, the Metropolitan Opera forged on with the performance. Netrebko’s singing career is not in jeopardy, in spite of her affiliation with Russia-funded terror in Ukraine, or with the President of Russia himself. Netrebko’s donation was supposed to go towards the restoration of the Donetsk Opera Theatre. Since the theatre was not damaged during the ongoing hostilities between the terrorists and the military of Ukraine, the funds will be used to pay the salaries of local theatre performers. So far, the theatre received only the certificate and not the money, which is being rapidly devalued in the ongoing ruble freefall. The donation is now worth less than $17,000 and may not do much to ease the suffering in Eastern Ukraine. It succeeded only as another shameless tool of Russian propaganda.